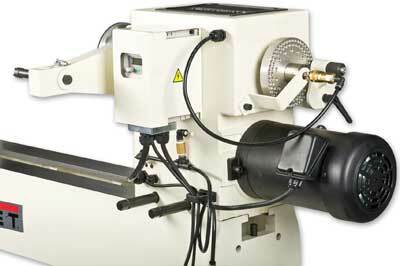 I first saw this lathe - branded as Powermatic in the USA - at the 2012 AAW symposium where it was launched. To say it caused a lot of talking and discussion is an understatement. The main comments centred around its size, weight, capacity and also the fact that it was already rigged up with a vacuum facility - you need to supply an appropriate compressor - but all of this certainly got tongues wagging. So when I got a call asking if we wanted to test one, I couldn't refuse. So very early one morning, Anthony Bailey and I set off to put the Jet 4224B through its paces at BriMarc's training facility in Devon. When we arrived the lathe was already fully assembled and connected to a compressor, but the first thing I did was to read the instruction manual. 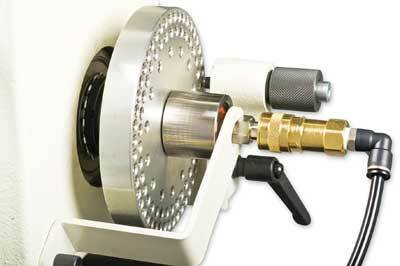 The manual is functional and gives you all the salient points concerning the use of the lathe. I would suggest that assembly of the lathe will take three able-bodied people in the first instance. From the photos, the assembly looks to be very straightforward. The lathe is very substantial. The bed casting is massive and this is well supported by a pair of sturdy cast legs. Everything about this lathe looks solid, hefty and well machined. The handwheel and levers are beefy and easy to handle. The control panel is easy to read and you can clearly follow what each knob, dial, button, etc. is for. It has a 3hp motor and a three-pulley speed range to choose from - the speed is electronically variable within the parameters of the pulley range chosen. The belts are changed by releasing a lever-lock handle on the side of the headstock, lifting the motor and changing the belts - which are accessed via a pull-down door on the front of the lathe near the control panel - changing the belt to the required pulleys and then closing the door, releasing the motor, tensioning it up and locking it in place. 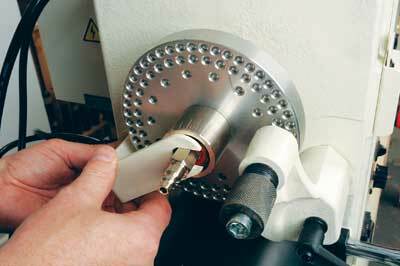 This lathe comes with a comparator - effectively this is two arms fitted on the back of the lathe with a spur and point to hold a spindle which is the sample you can then follow. When a spindle is placed in them you only have to raise your head a little to get a sight line for comparison with the master template. 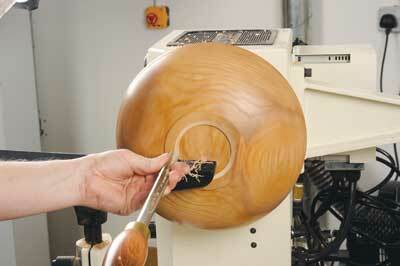 Of course, you must switch the lathe off when reaching over to measure the item, if you so choose. A very useful item indeed when copy turning. This heavy-duty lathe has an inbuilt vacuum system which comes complete with air gun and vacuum chuck for connection to your own compressor. The connection is a revolving bearing system which works in conjunction with the lathe spindle. It has a mating spigot which has O-rings to form the seal in the headstock outboard spindle. To stop this fitment from spinning around when the lathe is on, there is a metal holding bracket which is easy to remove if necessary and conversely, to secure in place. The wiring is neatly at the back of the lathe near the invertor and then it runs on the inside of the headstock. The vacuum chuck is an aluminium-machined unit which has a ribbed rubber seal - or similar material - on the front which will form the seal against smooth fissure/hole free and non-porous material. spindle lock on the front control panel of the lathe for this. To lock the pin in the right hole, simply push the pin in position and then tighten the knurled indexer knob. Only light pressure is needed for an excellent hold. The pull over guard is fitted in place on the headstock comparator arm by removing the centre from the arm and sliding a machined tenon into the hole left from the removable centre, and this in turn is locked in place via an insertable pin. The guard is wide enough to allow the full use of the over-the-bed capacity of the lathe and will take a lot of impact force should something give during your turning. This, however, does not obviate the need to wear appropriate PPE at all times when you are using this, or any other lathe. I tried the lathe with various combinations of spindle work and also faceplate work and found that it was very quiet, easy to use and had loads of power. I first of all tried an almost to capacity, over-the-bed bars bowl and found that the guard did not get in the way at all when working on the face of it and on the side of it. The guard is made from heavy-gauge wire but does not seem to inhibit unduly looking at the work. In fact after about five minutes, I forgot it was there. I mentioned the lathe had lots of power. While using the lowest speed range pulley setting I was able to take 20-25mm thick cuts without so much as a blip from the lathe. No power-fade, just a sweet cut. 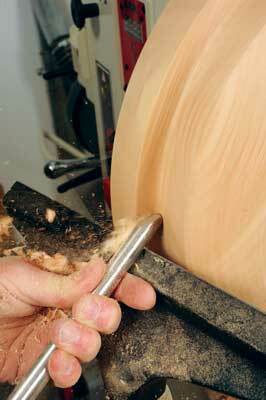 When spindle turning the guard was handy and again did not get in the way. 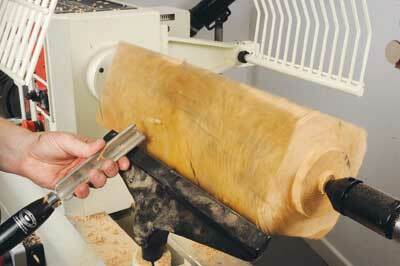 Not once did the lathe baulk at any cut I tried on the large oak (Quercur robur) spindle I was turning. 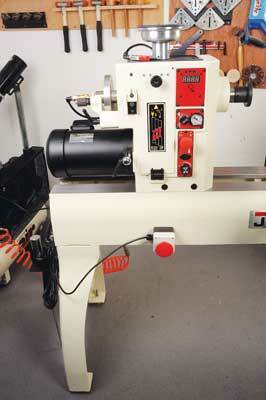 The variable speed is a sweet thing indeed, and did I mention how quiet this lathe was? It is very quiet indeed. 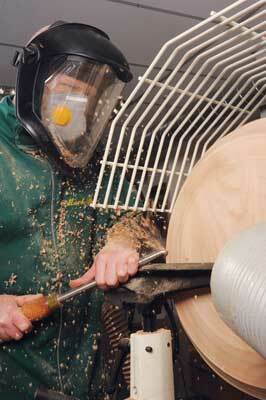 The vacuum system was used to finish off the bottom recess of a bowl and initially to shape a bowl. The vacuum chuck was fitted, the tailstock was used to centre the bowl against the chuck, the compressor was switched on and the dial switched over to activate the vacuum, the seal was formed against the bowl and the tailstock was then removed. The seal formed was strong enough that I could not pull the bowl or blank off the seal/vacuum. When turning the recess, I noticed a slight vibration during the cut but a micro cut sorted this out. However, I was intrigued. I loaded up a sycamore (Acer psuedoplatanus) blank and started to make some heavy shaping cuts and the seal was fine throughout this, but I did notice the vibration occurring again. On closer inspection, the front seal on the vacuum chuck was a little thick and allowed a bit of movement. I discussed this with the tech people and on returning back to GMC HQ received a call to say that this has been passed on and that they would rework the chuck and seal. Who says companies don't listen? The vacuum system is easy to use and once the seal is sorted, will be excellent. This is a great feature and one that I'm sure people will very much like. 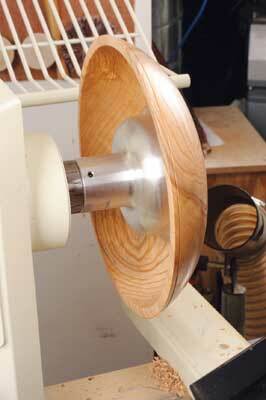 I have to say that I loved this lathe. 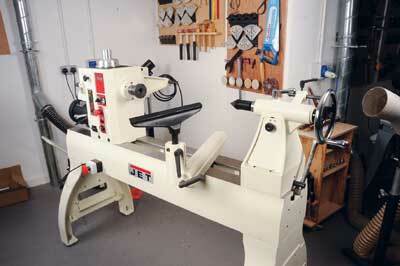 Is the Jet 4224B setting the standard for this size of lathe? 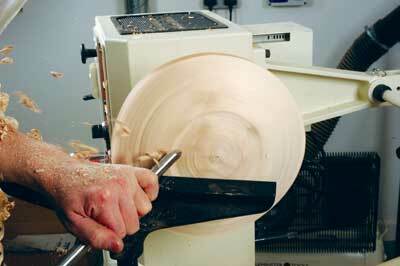 I certainly think other manufacturers producing this size of lathe will take a long hard look at it. OK, there was a slight hiccup on the vacuum seal on the chuck but this is being sorted. I know this is not a lathe everyone will need and the price, although excellent value for what you get in my opinion, is not an impulse buy for many. 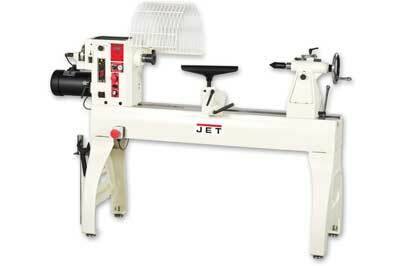 The Jet 4224B is certainly eye catching and is, I am sure, going to cause a lot of people to look and consider it as an option when thinking about buying a heavy-duty machine.